How sure are we that the diapophyseal and parapophyseal rami, and the cervical ribs, were not themselves pneumatised in apatosaurines? Definitely something to look for in the CT! Diapophyses and parapophyses usually are pneumatized, out to the fusion line. As for the rib itself, I’ve seen some fossae and sculpting at the intersection where the capitulum, tuberculum, and shaft come together, but no internal chambers in apatosaurines. I think that the CRs past the fusion points will still have more bone the centrum and arch, even including the diapophyes and parapophyses. But yeah, will be interesting to see what turns up on the CT. Definitely going to run this thing through sideways and hope for minimal artifacts. Hate to be “that guy,” but you mistyped MWC 1916 as 1946. Maxwell, what makes you say that? The tiny paper labels on the specimen itself say 1946. I think from the caption to Foster et al. (2018: fig. 18), which refers to this specimen as “MWC 1916”. But I am confident that’s a typo because the paper label on the specimen, the specimen card, and the database entry for it all say MWC 1946. I know because I had to fill out the paperwork to get it on loan. I apologize, that was my mistake. I did get that number from Foster et al., and I did a quick Google search to see which was the misspelling, and it seems that “1916” is given in several other sources. When I searched for “MWC 1946” Apatosaurus the only link I got was to this post, so I assumed that yours was the mistake. Sorry, about that. Hey, no need to apologize, all the info you had access to said otherwise! I also did a search for “MWC 1916” and I got John Foster’s (2005) chapter in the Thunder-Lizards book about juvenile sauropod material from Western Colorado. He lists MWC 1916 as a cervical centrum 104mm long (about 4 inches), so I think that clinches it as MWC 1916 belonging to a different specimen. 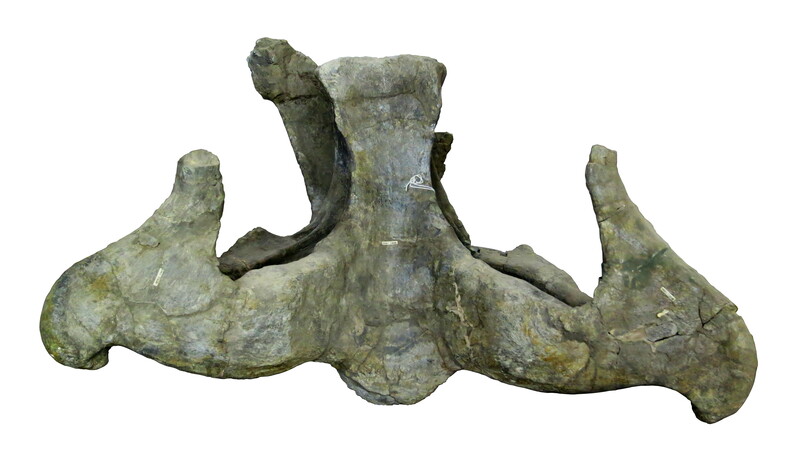 MWC 1946 is 360mm long, and about 650mm max width across the cervical ribs. But seriously, if you ever think we’re in error, _say so_. It won’t hurt our feelings, and we only get smarter if our mistakes get caught and fixed. 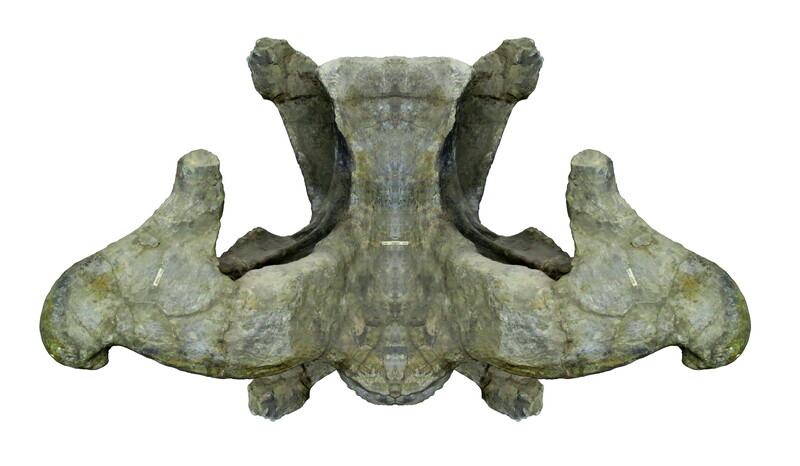 Is the variable robustness and orientation of the cervical ribs amongst Apatosaurus significant for species recognition? 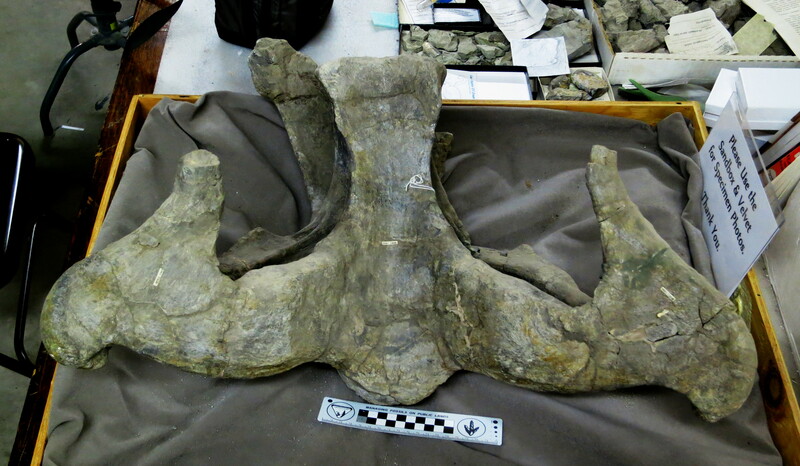 I’ve seen more gracile forms, even with variability of the anterior processes of the ribs on supposed Apatosaurine species. Good question. I’d have to check Tschopp et al. 2015. I know the size and orientation changes A LOT along the column. My sense is that different apatosaurine specimens have wildly different cervical morphology, even if you allow for serial changes. How that maps onto species or genera, I couldn’t say.